I came across this cute craft and is a great project and a way to recycle those 2 litre pop bottles. Easy to make with the children and they will love it. I thought it was so cute I had to share it. Kids will love saving money in an animal-themed bank they made themselves. When they are ready to spend, just pop off the cap! Tip: Before you begin, clean your empty bottle. Fill it up three-quarters with water and add a few drops of dish soap. Cap the bottle and shake vigorously. Remove the cap and rinse with water. Store upside down until dry. *Tip: When painting the 2-litre bottle, paint one half and set aside to dry. After it dries, paint the other half. This way, you never need to set a wet side down. 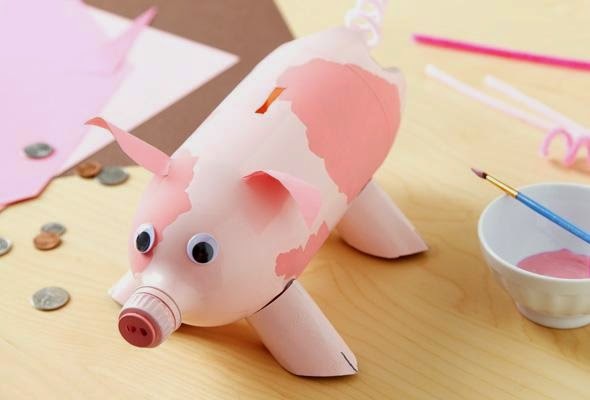 Piggy Bank VariationsTurn your piggy bank into a variety of other animals by customizing the instructions for the piggy bank to fit. Make a dog by painting the materials brown and opting for droopy ears. Tip: Have some fun making a dog “collar” from something that’s already in the house, such as a bandana, an oversized rubber band or even a collar that your real-life dog has outgrown. Craft a cat by painting materials black and white, making the ears pointy and using the pipe cleaners as whiskers. Make a penguin by using the bottom half of two 2-liters — held together by tape or glue — wrapping in black and white craft paper with a yellow beak. Turn the penguin into an owl by swapping out brown paper and paint. Turn a 2-liter into a lion by painting the materials yellow and adding a mane of brown and yellow paper strips. Tip: Let the kids choose their piggy bank pet’s colour. There’s no reason why a cat can’t be blue or a pig can’t be green. Let their imaginations run wild!